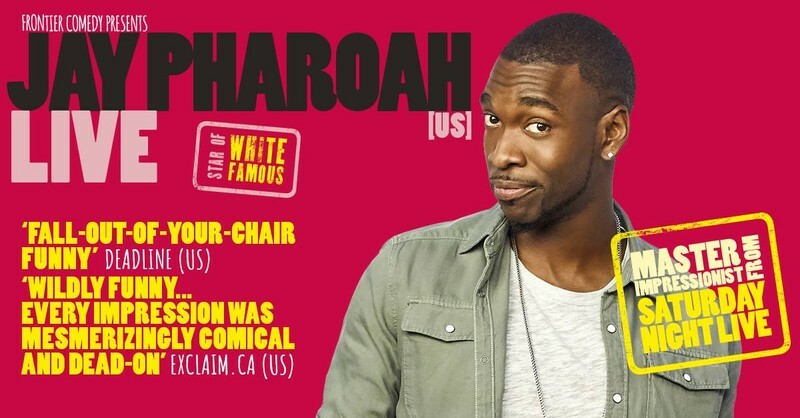 'Saturday Night Live' alumnus, stand-up comedian, actor, rapper and impressionist Jay Pharoah is making his Australian debut this May. One of the 10 youngest ever cast members to join the 'Saturday Night Live' players, Pharoah remained for a huge six seasons as a writer and cast member on the long-running sketch series. During this time, he achieved legendary comedic status for his impeccable impressions of public figures as diverse as former President Barack Obama, Family Guy’s Stewie Griffin, Eddie Murphy, Nicolas Cage, Kanye West, Drake and Justin Bieber. In 2015, he was honoured by Rolling Stone Magazine as the 55th greatest 'Saturday Night Live' cast member in the show's history. With scene-stealing supporting roles in 'Get A Job' alongside Bryan Cranston, Chris Rock’s 'Top Five', 'Ride Along' with Kevin Hart and Ice Cube, 'Intramural' and 'Lola Versus', Jay has invaded the movie scene since departing SNL. While he’s voiced various roles in much-loved animated TV series like 'Family Guy', 'BoJack Horseman', 'Robot Chicken' and 'SuperMansion', it was Jay’s starring role in Jamie Foxx’s loosely autobiographical vehicle 'White Famous' that launched him into millions of lounge rooms when it aired on Showtime in the US and on Stan in Australia. As an overweight teenager growing up in Virginia with ADD, 17-year old Jay turned to jokes and impressions to turn around the bullying he suffered at school by making his tormentors laugh. Now as a globe-trotting, headlining adult comedian, Pharoah’s famous impressions combined with personal stories see the high-energy headliner a constant on the US comedy and college circuit. While Pharoah’s tenure on 'Saturday Night Live' may be behind him, he hasn’t left the characters that originally made him famous. His live show is a amusing, high-energy pastiche of stories, characters and SNL-level jokes which have carried the comedian all over the world, and with tours of the US, UK and Canada under his belt, he is thrilled to be making his Australian debut this May!